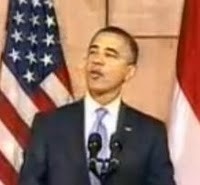 However, Obama is surely well aware that Sharia law, an Islamic based legal system, is taking hold in Indonesia. The Indonesian province of Aceh was the first to implement Sharia law in the entire province. In 2008 The Telegraph took a poll in Indonesia and found 52% favored Sharia law. Last year The Christian Post reported that more than 50 regencies in 16 of the 32 provinces in Indonesia have passed laws linked to sharia. Sharia law requires penalties such as stoning to death persons who commit adultery, amputation of the hands of thieves, and execution for any Muslim who leaves the faith. While praising this religious tolerance in Indonesia, Obama says we as Americans need to improve our relations with Muslim nations.